Founded 1,200 years ago in the northern part of Morocco, Fes has remained to be the country’s cultural and spiritual capital. It is home to the oldest university in the world and its medina, a UNESCO World Heritage Site. Fes has the best-preserved old city in the Arab World and to spend a few nights inside those walls is to, in some way, experience its unique culture. “When you reach the train station, please call this number”, Said (Sa-eed) advised on his email. 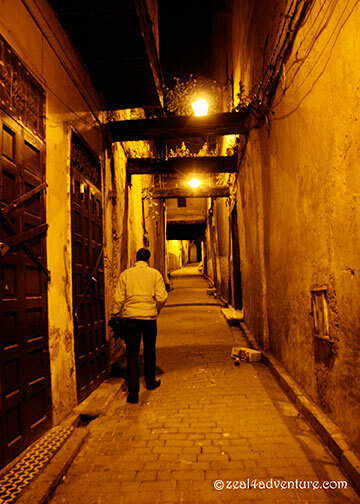 “A handsome young man will meet you at the bank outside Bab Boujeloud.” – the main and most attractive point of entry into the medina, Fes el Bali. A petit taxi outside the train station, he advised, would cost 10 Dh to get us to the main gate. And true enough; handsome young man introduced himself as Ibrahim. Decorated with blue (color of Fes) zellij tile on the outside and green (color of Islam) on the other side, the gate leads to the Bab Boujeloud Square. Meandering through the narrow alleys teeming with people, restaurants and lodgings called riads and dars, provided a perfect primer of Fes. The passages taper as we marched deeper into the medina, the maze of corridors begin to confuse. We finally reached a wooden arched door in an uncommonly narrow lane. 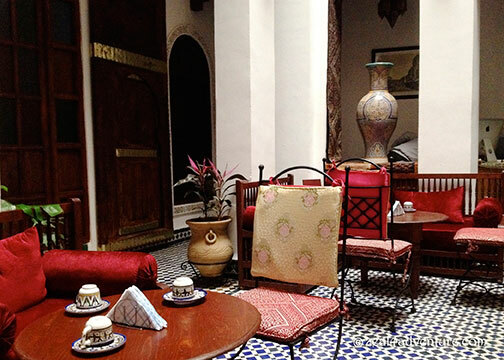 Ibrahim unlocked the door and welcomed us into a world bursting with exotic eastern charm. Dars and riads are traditional homes unique to Morocco. 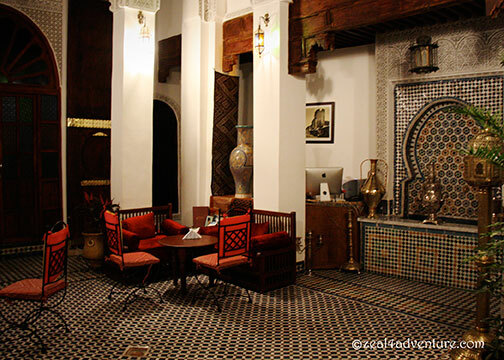 Entirely closed on the outside, the dar’s foyer serves as gatekeeper that led to an inner courtyard of traditional zellij (small colored tiles) floors, exquisite Moroccan design and furnishings with touches of deep red. The courtyard is the center of the house and serves as seating and dining area. The second floor balcony overlooks it. A burly man, Ibrahim’s uncle, Said warmly welcomed us to Fes. He owns Dar Labchara, a lovely house he inherited from his father. 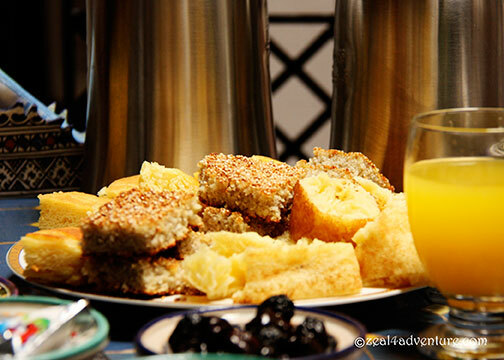 While we sipped tea and recharged from the four-hour journey, he gave us a rundown of what to expect of Fes. We met a guy on the train also named Said, we told him, exceptionally friendly and extremely eager to help. “You are the 3rd guests who met him”, he said. “Does he wear a black leather jacket?” Said asked. He revealed that one of his guests decided to pay the factory (he said he owned) a visit and found that the Said from the train isn’t quite what he presented himself to be, pretending to own a ceramic factory when he only earns a commission for bringing “tourists” there. Not exactly harmful, but neither was he truthful. And with that, he candidly warned of fraudsters roaming the narrow alleyways of the medina. Warnings of this manner I came across while researching for this trip, I was still shocked, however, to have met one so early in the trip. 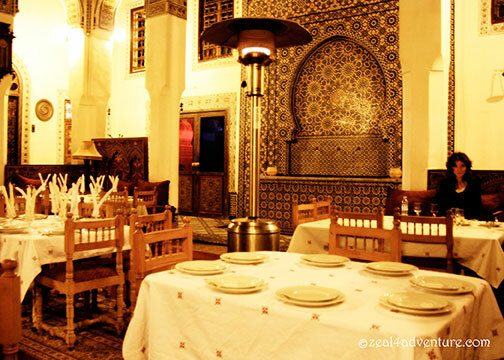 For a traditional Moroccan dinner, Ibrahim pointed us to the nearby Restaurant Palais des Merinides, assigning Mohammed, a staff, to bring and fetch us after. Beautiful interiors. 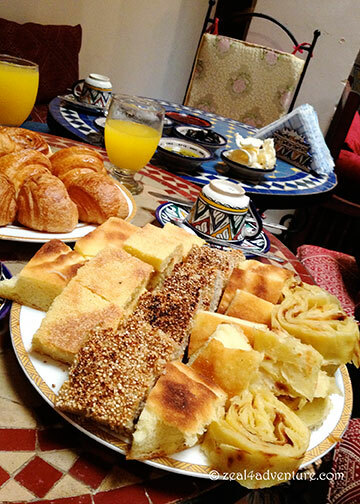 As the culinary center of Morocco, my expectations were high. Maybe too high because the food was actually decent but impressed we were not. The Pastilla Fassia (chicken pastille) was flavorful and memorable, the play in sweet and savory appealed to me but not to everyone in the group. 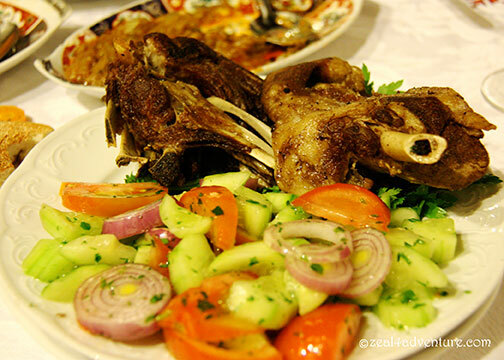 The Mechoui (roasted mutton) was not as tender as I wished it to be. They say that many restaurants like this pay commission for sending guests over, I hope this wasn’t the case with our dar. Breakfast, however, was a different story. It more than made up for last night’s lackluster effort to wow. were enough to overlook the lack of any meat in the morning. To complement the breads were cheese, butter, jams and honey, fried eggs served in a pool of olive oil seasoned with cumin and salt. 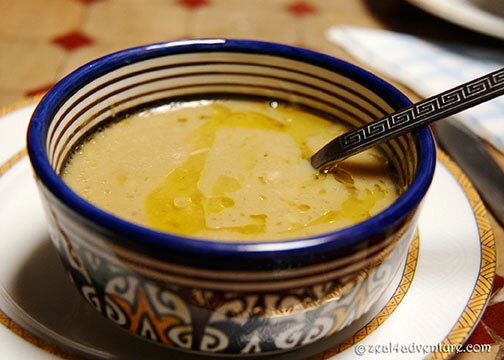 One morning, we were served a traditional soup called bessara. It is pureed beans served with olive oil and cumin. Usually eaten at breakfast and a prefered soup during Ramadan. Tastes like pea soup with a strong olive oil taste that leaves a slight bitter aftertaste, which quite frankly, appealed to me. 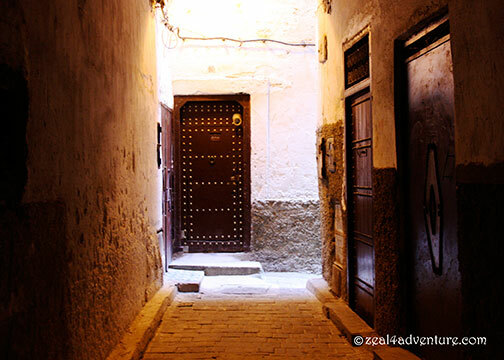 From the street, the houses in the medina is hidden by a high wall with a door somewhere, giving no clue as to what lays beneath. But once inside, one is transported into a remarkable intricately decorated palace. Fes, in a similar fashion, reveals its charm unexpectedly, its mysteries difficult to comprehend but once revealed, opens up to a brilliant world within. The key is to run straight in. wow. what a fascinating culture. a co-worker just got back from morocco too. the tilework is the one thing that pulls me towards visiting. must start saving now. What an adventure, to go beyond the usual tourist traps and experience a little of the life within. Wonderful adventure. Wish I will have a chance to not just go to a place like I usually do, but experience something like you did. Looks like a delicious breakfast! Also love the patterns of the tiles. A great adventure — and to go to places most tourists didn’t go to is extra special….Thanks for the guided tour! 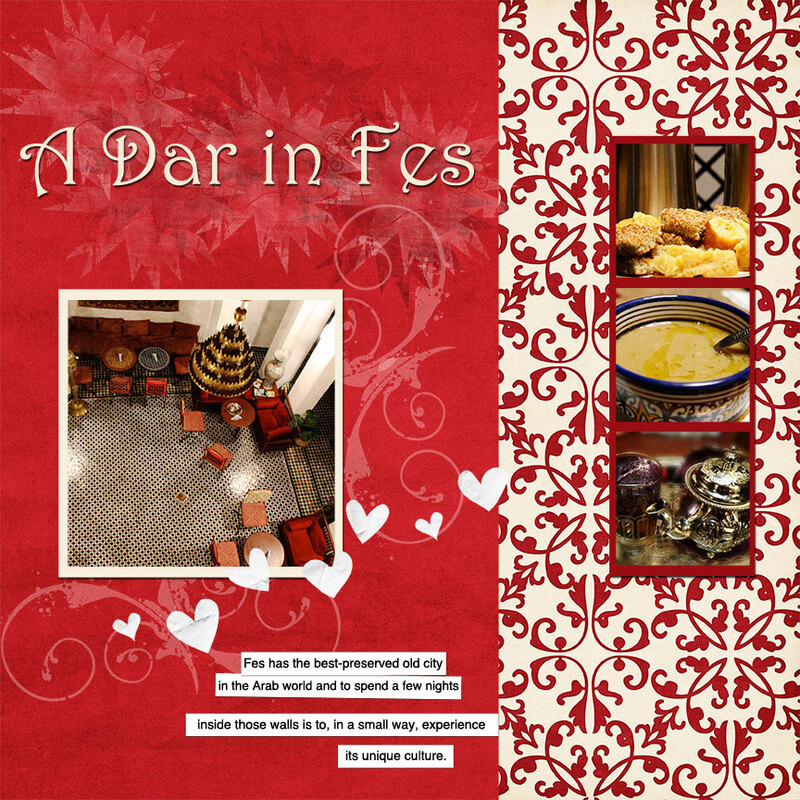 Your photography really makes me want to go to Morocco! I love the 2nd and last image especially with its warmth and interesting perspective.